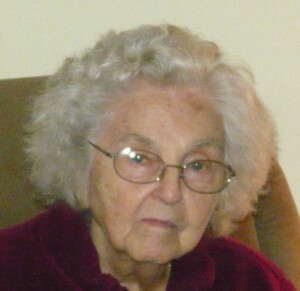 Anna Lee McLaughlin Rotruck, 89, of Fulton, NY and Morgantown, WV, passed away peacefully at Oswego Hospital on Tuesday, June 21, 2011. She was born February 24, 1922 in Keyser, W.V., a daughter of the late George and Hazel Feaster Houdyshell. In addition to residing in Keyser, Fulton and Morgantown, Anna had also lived in Volney, NY and Valinda, CA. After her retirement from Mattel, Inc. in El Segundo, CA, she worked for several years at the Keyser-Mineral Public Library. Anna enjoyed bird watching, sewing, quilting, and gardening. She was predeceased by her husbands, William T. McLaughlin and Donald G. Rotruck; a son, William T. McLaughlin, Jr.; grandsons, Robert T. Bristol, Michael J. Rotruck, and Shane Rotruck. Anna is survived by one sister Mary E. Oates, of Archer, FL, five daughters, Phronsie A. Bristol of Fulton, NY, Marlita S. (Edward) Swopes of Montclair, CA, Sandra C. (John) Griggs of Montclair, CA, Sherry C. Rotruck of Yucca Valley, CA and Annette D. (Michael) Neeley of Pomona, CA; two sons, Donald J. Rotruck and Gerald E. Rotruck both of Morgantown, WV; grandchildren, Dawn Bristol and Rene Ormbsby both of NY, Wendy Tynon, Robin Smith, Heather Fox, Nick Nakamura, Kimberly Nakamura all of CA, Donald Rotruck, Jeremy Rotruck and Laura Rotruck all of PA, Aaron Rotruck and Justin Rotruck both of WV; several great grandchildren, nieces and nephews. There are no calling hours. A celebration of life will be held at the home of Phronsie Bristol, 623 Seward St., Fulton, on Saturday, July 9, 2011 from 1 to 5 p.m. Contributions in memory of Mrs. Rotruck may be made to Friends of Oswego County Hospice, P.O. Box 102, Oswego, NY 13126-0102 or to the American Cancer Society, 6725 Lyons St., P.O. Box 7, East Syracuse, NY 13057-0007. Foster Funeral Home, Fulton has care of arrangements.